A discrete Radeon RX 540 GPU gives it a touch of power. The Samsung Notebook 9 Pro offers a little bit of everything for mainstream users, plus some nice extras: a discrete Radeon RX 540 GPU, pen support, and long battery life. The Samsung Notebook 9 Pro is aiming for the middle, in a good way. Compared to other models we’ve tested recently that offer a high-resolution touchscreen display, a 360-degree hinge, a cool metal chassis, and even pen support, it’s carefully designed to offer a little bit of everything, with a few standout features: a discrete Radeon RX 540 GPU, an integrated S-Pen with special Samsung applications as well as Windows 10 inking compatibility, and impressively long battery life. Given its good overall showing, the Samsung Notebook 9 Pro is a laptop many people can like, including entry-level gamers. You’ll see us comparing it to two other 15-inch laptops with 360-degree hinges: The Lenovo Yoga 720 is very similar in design and price, but its Nvidia GeForce GTX 1050 discrete GPU makes it heavier and hotter as well as faster. The 15-inch HP Spectre x360 is considered a class leader, but you might be surprised at how it performed in our tests compared to the Notebook 9 Pro. 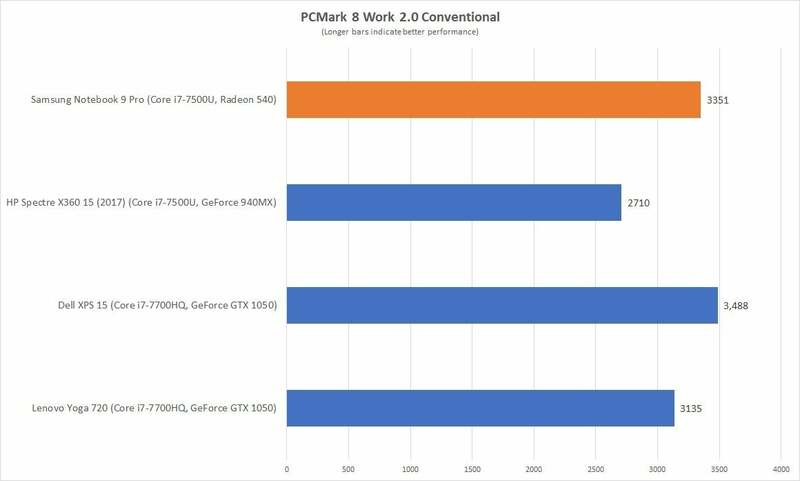 The Notebook 9 Pro model we tested (poetically named NP940X5M-X01US) costs $1,300 as configured and is the higher-end of the two SKUs in this product line (we’ll briefly describe the other SKU below). CPU: Intel Core i7-7500U. This is a 7th-generation Kaby Lake dual-core CPU with a base clock of 2.7GHz and a maximum clock speed of 3.5GHz. It’s a pretty good chip, but as you’ll see in our tests, the performance difference between dual-core and quad-core CPUs is significant. RAM: 16GB of DDR4 RAM. 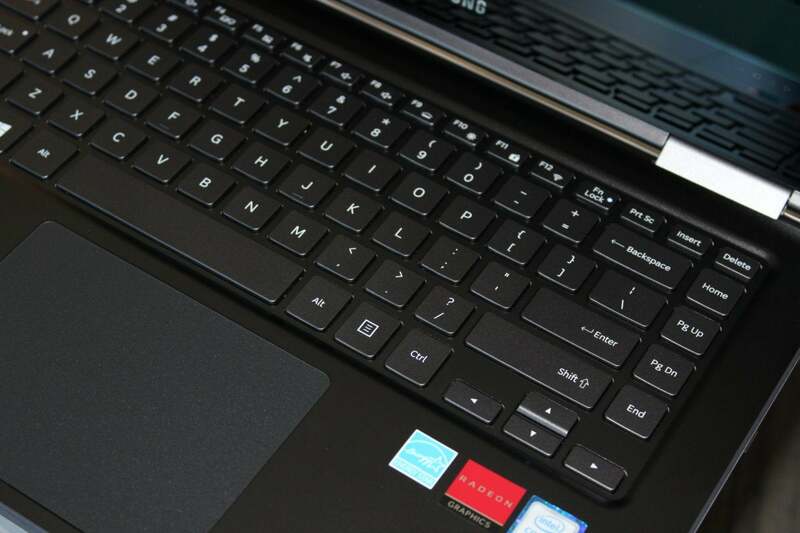 You’ll still see some laptops with just 8GB, but 16GB is the sweet spot right now. 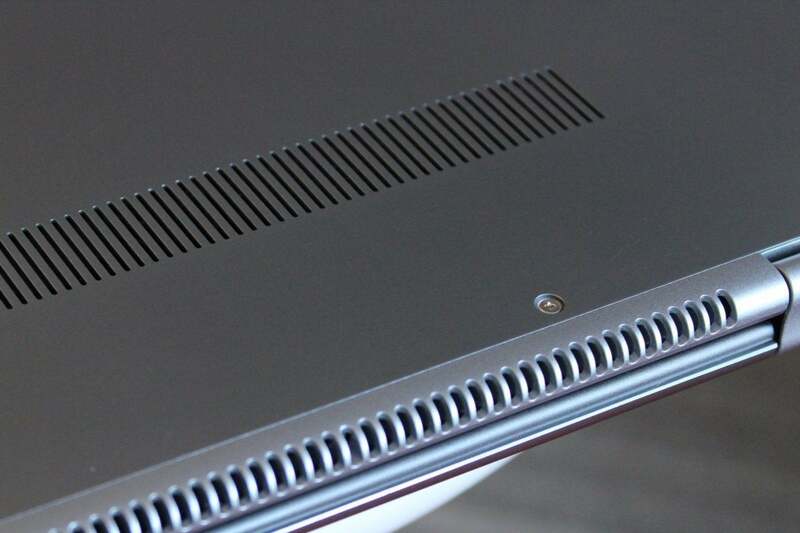 The Samsung Notebook 9 Pro has subtle grillwork on the bottom panel for air intake, and along the hinge for exhausting warm air. The fan is whisper-quiet. GPU: AMD Radeon RX 540 with 2GB of GDDR5 memory. This lower-end discrete GPU isn’t going to burn any barns, but it’ll suffice for light gaming. Display: 15-inch, FHD (1920x1080) IPS LED touchscreen whose top bezel houses a 720p webcam and a facial sensor for use with Windows Hello. The display offers a measured maximum brightness of 344 nits (in line with Samsung’s 350-nit spec). You wouldn’t want to crank it up all the way, however, especially when running on battery, as brighter displays consume more power. 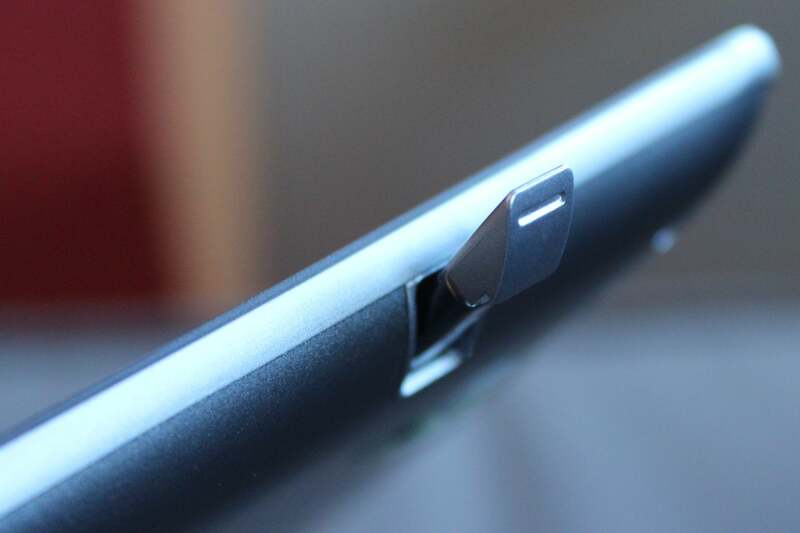 The ports on the right side of the Samsung Notebook 9 Pro include microSD and two USB-A. Storage: 256GB SATA3 M.2 SSD. A Samsung model, natch, and a good size. Ports: One USB 3.1 Gen 1 (5Gbps) Type C, two USB 3.0 Type A, microSD. 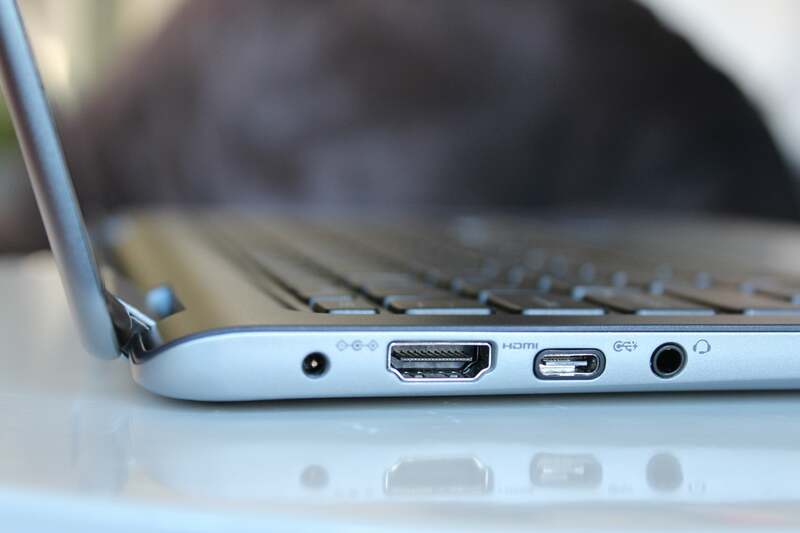 To its credit, there’s also a full HDMI port for connecting an external display. 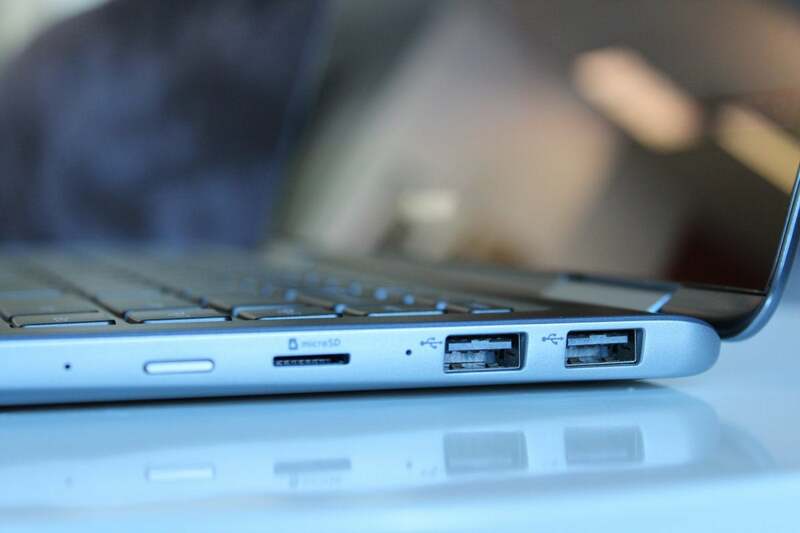 This handy port is getting harder to find as laptops get slimmer. The ports on the left side of the Samsung Notebook 9 Pro include AC, HDMI, USB-C, and audio. Weight: A tote-able 3.8 pounds. Add another 0.7 pound for the AC adapter. This compares well to 4 pounds, 7 ounces for the 15-inch HP Spectre x360 and 4 pounds, 9 ounces for the Lenovo Yoga 720. The Notebook 9 Pro has a lower-priced sibling, the NP940X5M-X03US, which differs in having a lower-end dual-core CPU, specifically the Core i5-7200U, and only 8GB of RAM. At $1,100, it seems like a lot to sacrifice for just $200 in savings. 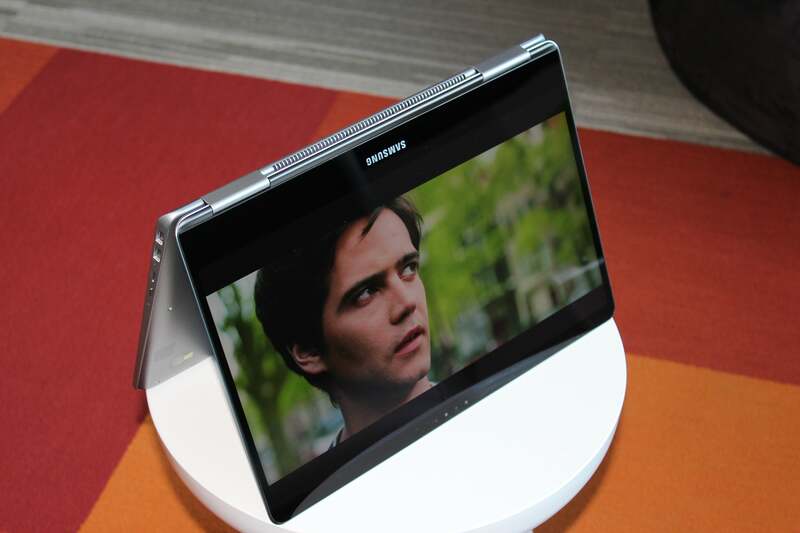 The 360-degree hinge lets you use the Samsung Notebook 9 Pro in orientations from clamshell to tent mode (shown) to tablet mode. The Notebook 9 Pro has its quirks, but overall it’s a well thought-out product. Sure, you won’t get the charisma and drama of a flagship, but pretty much everything works. The matte-aluminum chassis with chromed Samsung logo is tasteful and sturdy. There’s barely any flex in either half of the body, and the 360-degree hinges feel rock-solid. We appreciate the lighter weight as well—bringing it along doesn’t feel like a hard choice. The Samsung Notebook 9 Pro has a comfortable keyboard, with slightly concave keys for easier typing. The keyboard texture is slippery, but the slightly concave keys help keep fingers where they’re supposed to be. The keys feel comfortably spaced, none are in an odd location, and their travel feels comfortable. The trackpad is very large and responsive, and its centered location is great—it’s always disconcerting when it shifts to one side. More and more laptops offer pen support, but Samsung had a head start with the S-Pen technology it was already using on its Android tablets and phones. A huge advantage off the bat: The pen is housed in its own slot in the underside of the Notebook 9 Pro, rather than in some floppy loop or loosey-goosey magnetic connection. You will need to find a safe place for the special tweezers for removing and installing the spare nibs that come with the laptop. 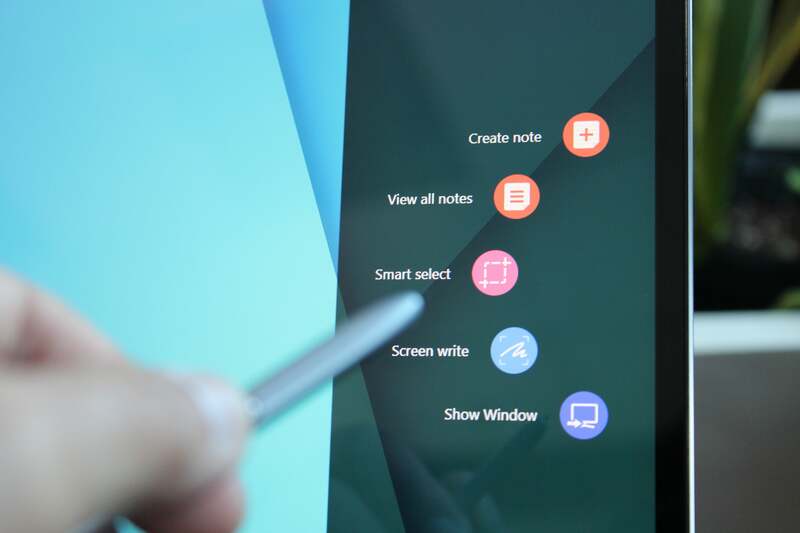 In addition to its support for Windows 10 inking features, the S-Pen comes with its own note-taking, drawing, and other productivity apps. Collectively called Active Command, they’re easily summoned when you remove the pen from its slot or press its button when it’s near the display. I enjoyed all of them, especially how you can digitally mix colors in the drawing app, and how you can select video clips with the pen to make your own animated GIFs. Press the S-Pen’s button to summon the Air Command menu of Samsung pen apps. The S-Pen also works with Windows 10’s inking features. There was only one glaring fault in our test unit, and that was the audio. The dual speakers in the Notebook 9 Pro, nestled into the bottom panel, have a surprisingly limited volume range, especially considering that this laptop is meant to play games as well as stream media. On the brighter side, the Notebook 9 Pro’s discrete GPU runs pretty cool. The slender intake grille on the bottom panel and the exhaust vent between the hinges murmur gently during operation. The Notebook 9 Pro’s test results follow its path of moderation—with one important exception. You’ll see it tracks closely with the similarly configured 15-inch HP Spectre x360 on most tests. Although the similarly designed Lenovo Yoga 720 has the advantage of a quad-core CPU and a more powerful discrete GPU, the Notebook 9 Pro shows it a thing or two. But wait ‘til you see the battery life, which is truly impressive and could be the deciding factor for some users. Our first test is PCMark Work 8 Conventional, which simulates everyday activities like web browsing, video chat, and document editing. It’s a good test for isolating the CPU’s role in everyday use. Any machine scoring 2,000 or above will sail along smoothly during these low-intensity tasks. The Samsung Notebook 9 Pro can hold its own in mainstream applications, even against quad-core competition. It’s a light test, so it’s not surprising that the Notebook 9 Pro gets right into the mix with the quad-core competition. The HP Spectre x360 lagged behind somewhat because of its 4K display, which simply demands more processing power. Cinebench R15 offers a useful counterpoint to PCMark Work 8 Conventional. It’s a free 3D rendering test based on Maxon’s professional Cinema4D engine. It’s almost entirely CPU-bound and scales well with the number of cores and threads. In the case of the Notebook 9 Pro, you can see a starker difference between its dual-core CPU and the quad-core you can get with the Lenovo Yoga 720. 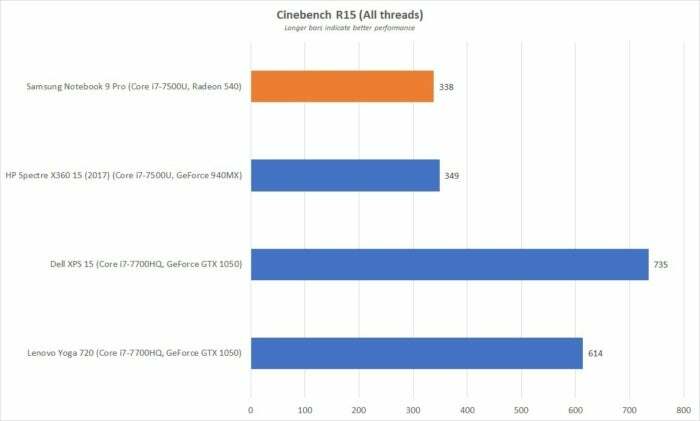 In the CPU-intensive Cinebench test, the Samsung Notebook 9 Pro performs as we’d expect for a dual-core CPU, hanging far back compared to quad-core CPUs. Editing and converting videos offers another good test of dual-core vs. quad-core, because more cores make a big difference. We used the popular and free Handbrake encoder to convert a 30GB 1080p video using the built-in Android tablet preset. Because of how long it runs, the results can also reveal how a system handles itself under heavy thermal load. 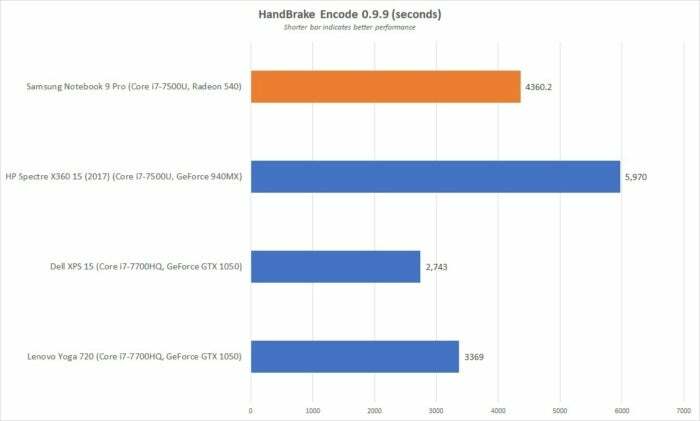 The Samsung Notebook 9 Pro surprised us in the Handbrake test, performing its video conversion faster than the similar HP Spectre x360. As you can see in the chart above, the quad-core Lenovo Yoga 720 and Dell XPS 15 handily beat the dual-core Notebook 9 Pro at this intensive task. However, the Notebook 9 Pro in turn makes the HP Spectre x360 look like a laggard, likely because of thermal throttling. 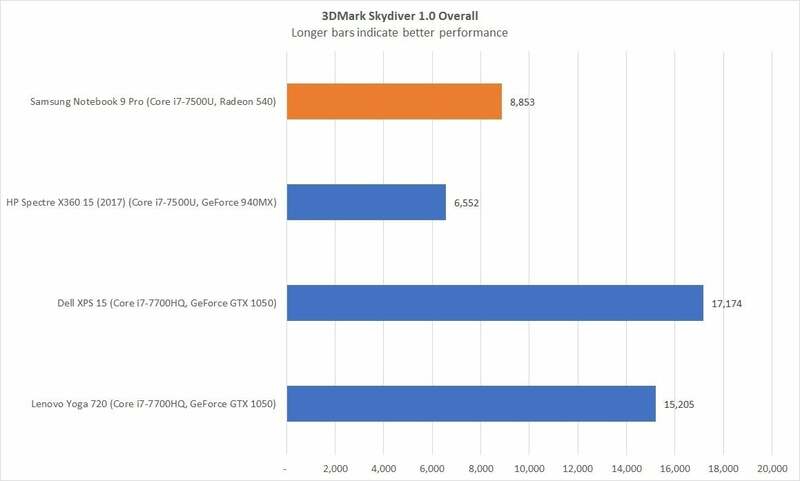 The Samsung Notebook 9 Pro performs predictably in the GPU-intensive 3DMark Skydiver test given its moderately powerful RX 540 GPU. No surprise, the more powerful graphics engines in the Lenovo Yoga 720 and Dell XPS 15 prevail in this test. To its credit, the Samsung Notebook 9 Pro achieves a lot with what it has, especially compared to the HP Spectre x360. 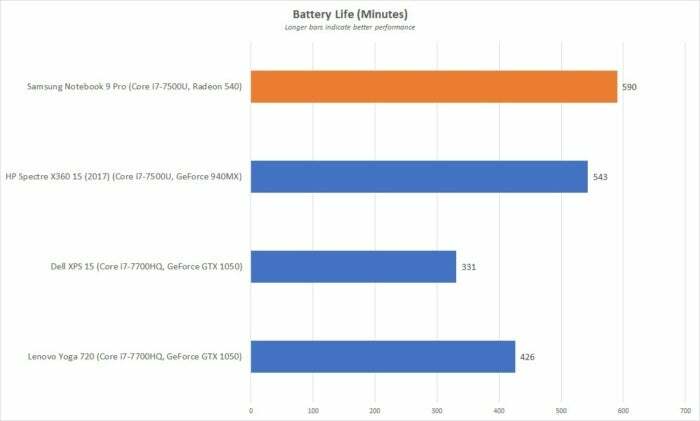 On top of this strong overall benchmark performance, the Notebook 9 Pro can rightfully boast about its battery life. Note that your mileage will vary depending on how you use your laptop, and what power-sucking or power-sipping components it might have. For our test, we set the display brightness at an office-typical 250 nits and run down the battery by looping a 4K video, with a pair of earbuds plugged in and the laptop set to airplane mode. The Samsung Notebook 9 Pro posted an impressive 590 minutes, or nearly 10 hours, of battery life. The Notebook 9 Pro has a 4-cell, 3,530 mAh/54Whr lithium ion battery, which lasts up to 11.5 hours, per Samsung. In our test it lasted 590 minutes, or nearly 10 hours, long enough for most people to get through their day. The other laptops in this chart have much larger batteries (79.2Whr for the HP Spectre x360, 97Whr for the Dell XPS 15, and 72Whr for the Lenovo Yoga 720), but they can’t keep up with the Notebook 9 Pro—their systems demand more power. A bonus feature we didn’t test: You can squeeze a little more life out of your laptop by charging it with any USB-C-connected smartphone battery pack. You won’t be able to recharge the laptop fully, but it’s a nice backup if you’re running on fumes. Anecdotally we also tried a third-party USB charger on the Notebook 9 Pro, and it was willing to take a charge. Samsung's Notebook 9 Pro enhances its mainstream design with three notable features: a 360-degree hinge, a Radeon 540 discrete GPU, and the S-Pen stylus. It does a good job of giving you a little bit of everything, and the battery life is great, but the pen support is the biggest edge it has over the competition.